We take great pride in preserving and protecting some of our city’s most significant historical structures by identifying endangered buildings and, where possible, acquiring and renovating those structures for new uses. In succeeding years, the old building served as a coffin factory and a warehouse, before standing vacant for several years. Numerous appeals were made to save Old St. Luke’s, but it was not until the north and south wings were demolished in 1975 that a non-profit group, Old St. Luke’s Restoration, Inc., was able to purchase the property and preserve the central structure. 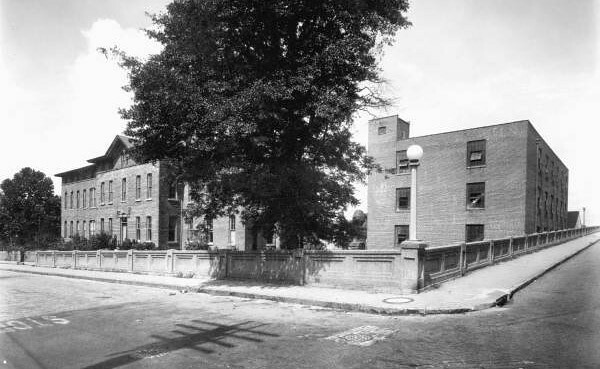 St. Lukes Hospital and the adjacent Forida Casket Company, circa 1937. Photo courtesy of FloridaMemory.com. In 2012, the Jacksonville Historical Society purchased St. Luke’s Hospital and the adjacent Florida Casket Company building, built circa 1924, with the intention of creating a new center for Jacksonville’s history. The purchase has allowed the Society to consolidate its large and scattered archive collection, and to provide the public with a wide range of document preservation programs and materials for the preservation, exhibition and study of all aspects of the history of Jacksonville and Northeast Florida. Our St. Luke’s campus has exciting potential and sobering challenges. By all measures–organizational, management, financial and potential–it is larger than anything we have ever done before. It is also an once-in-a-lifetime opportunity for the Historical Society to provide the community with one central location to study all aspects of local history. This towering gothic church, which serves as the Jacksonville Historical Society Headquarters, was constructed in 1888, and was the only major church to survive Jacksonville’s Great Fire of 1901. It is built of pressed brick laid in black mortar, with stone trimmings. The ground plan is cruciform, with the vestry-room on one side and the organ-chamber on the other forming the transepts. The chancel and nave are separated by three arches of masonry. The interior woodwork of the building is Florida pine, and the doors are made of solid mahogany. The ceiling is panelled with yellow pine. The tower rises to a height of 120 feet, at one time the tallest in the city. With the coming of the NFL football team, the city government purchased much of the land around the newly constructed Stadium, including the Old St. Andrew’s site. The Jacksonville Historical Society was given the rights to the building if it could restore it. Thanks to the city’s cooperation and a challenge grant from the Weaver Foundation, JHS was able to raise a million dollars to complete the restoration of the old church to use as its headquarters. 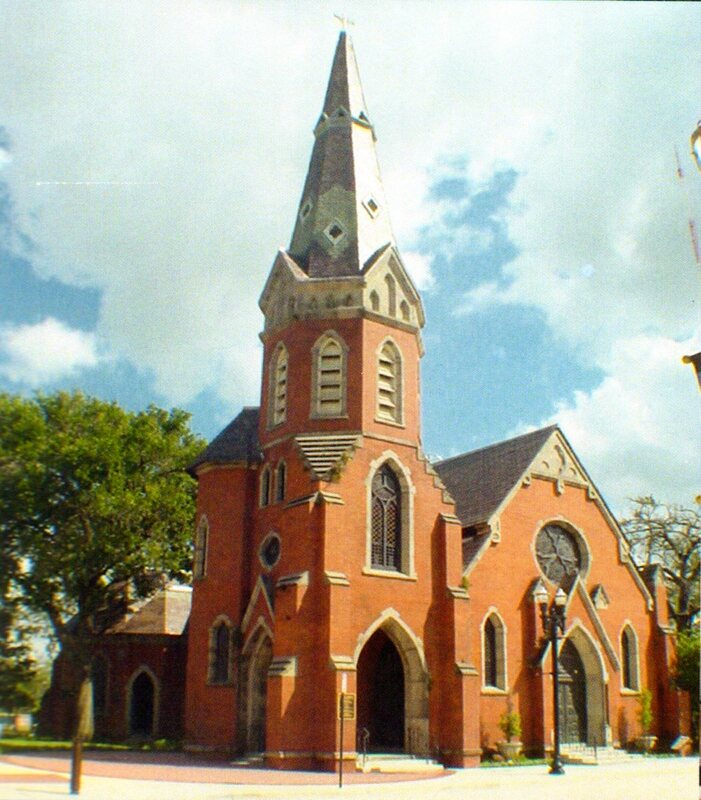 Old St. Andrew’s stands proudly today as one of the finest specimens of nineteenth-century architecture in Duval County, and it is a popular spot for meetings, weddings and other civic events. Did you know Old St. Andrews is available for wedding and event rentals? The Merrill residence is the largest and most architecturally interesting of the nineteenth-century houses remaining in East Jacksonville. In about 1875 James E. Merrill started a small iron works in Jacksonville after learning the black-smithing trade from his father. Known as the Merrill-Stevens Engineering Co., by the late 1880’s the iron works became one of the largest shipbuilding companies in the South. In 1886 Merrill built this house at 229 Lafayette Street, just a short walk from his iron works on East Bay Street. It exemplifies the Queen Anne style, with a square tower on the southwest corner and an elaborate vergeboard in the north gable. The porch posts, brackets, and spindles reflect the Eastlake style. In recent years it suffered lamentable deterioration. 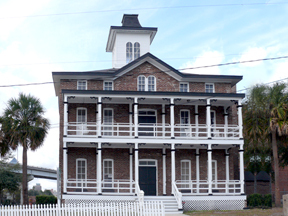 The Jacksonville Historical Society, in cooperation with the Mayor’s office of the City of Jacksonville, undertook the saving of this house in 2000. The building was moved to 311 A. Philip Randolph Blvd. next to Old St. Andrews Church, where its restoration was begun. In March 2002, the Merrill House was moved again, to be better situated further from the construction of the new baseball stadium. 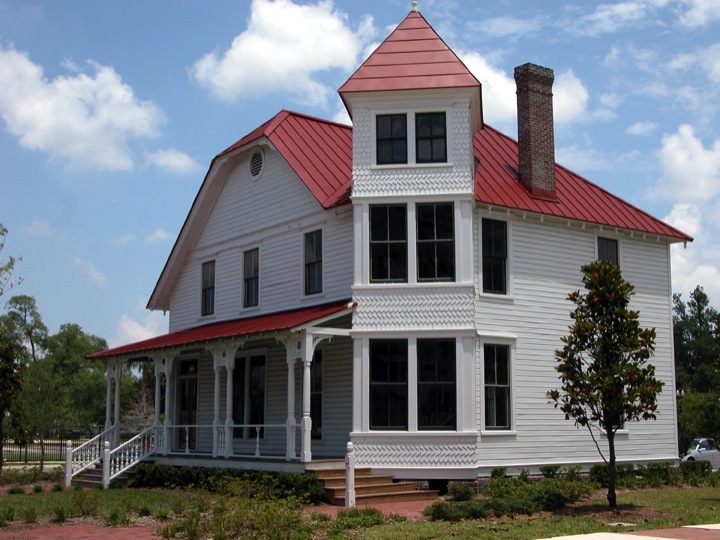 Its new location is one block to the north.With the completion of the renovation in December, 2005, it serves as an annex to the Jacksonville Historical Society’s headquarters and as a house museum celebrating the American Victorian period in Jacksonville.